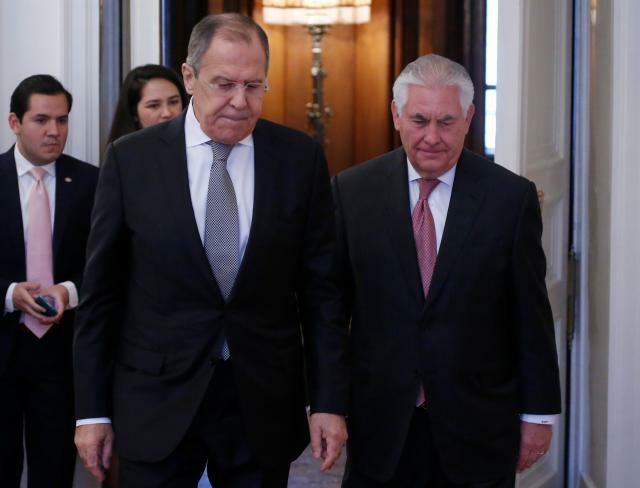 US Secretary of State Rex Tillerson (left) and Russian Federation Minister of Foreign Affairs Sergei Lavrov (right). Reportedly, US President Donald Trump and Tillerson have sought to isolate Russia for backing the Syrian government after its chemical weapons attack in Idlib. They were also allegedly working to put international pressure on Moscow to change course. Yet, since the cruise missile strikes and bilateral talks, the situation regarding the US and Russia on Syria has actually improved. Change may be possible on US and Russian positions on more issues, but only through bold, determined diplomacy. According to an April 12, 2017 New York Times article entitled “US Takes Sharper Tone on Russia’s Role in Syria,” US President Donald Trump and US Secretary of State Rex Tillerson have sought to isolate Russian Federation President Vladimir Putin for backing the Syrian government in the wake of its lethal chemical weapons attack on civilians. They were also reportedly working to build international pressure on Moscow to change course. In support of that conclusion, the article reports that on April 12, 2017, Tillerson came away from his meeting with Putin without reaching agreement on facts involving the chemical weapons assault in Syria or alleged Russian interference in the 2016 US Presidential Election. In describing the joint news conference with Russian Federation Foreign Minister Sergei Lavrov following the meeting with Putin, the April 12th New York Times article quotes Tillerson as saying, “There is a low level of trust between our countries.” It reports he further stated, “The world’s two foremost nuclear powers cannot have this kind of relationship.” Noting the level of tension surrounding the aftermath of the Syrian chemical weapons attack, the article asserts, a quick détente seemed a remote possibility. Further supporting that suggestion, the article reported that during a thirty minute news conference at the White House, Trump declared, “Right now, we’re not getting along with Russia at all–we may be at an all-time low in terms of a relationship with Russia.” The point was additionally made in the article that events have sharply diverged from the meeting of the minds between the US and Russia that Trump frequently aspired to when he was campaigning, and there was no visible warming of the relationship. Yet, conversely, the same article explains that although Trump said the US-Russia relationship was failing, he held out hope that the two countries could come to terms, suggesting that Tillerson’s talks with Putin had gone better than expected. Although it highlighted occasions when the Trump administration in Washington, Moscow and New York, publicly chastised Putin, the article also indicated that the administration was privately working hard to “hash out” differences with him. As greatcharlie affirmed in a previous post, the press, the news media, serves a free, effective democracy best, and is at its very best, when it unearths what is concealed or clarifies what may be confusing to the public about government actions. The press ensures power in a democracy remains in the hands of the people. Such efforts by the press are in great variance with reporting on Trump’s actions and intentions concerning the April 6, 2017 Tomahawk cruise missile strikes and relations with Russia on Syria. In the US, in particular, newsmedia pundits and policy analysts have meted out judgments of Trump’s decisions and actions akin to those once made “on the drumhead” for soldiers, an archaic type of summary military trial where only sentences were given and no interest was paid to evidence or arguments. (A drum is turned on its head and used as “the seat of justice.”) Another disquieting trend of news media criticism of Trump is to insist that he should follow some schedule and make certain decisions based on some template they apparently have in mind of how US presidents should act. (They would likely prefer a carbon copy of what they have found comfortable for nearly a decade.) 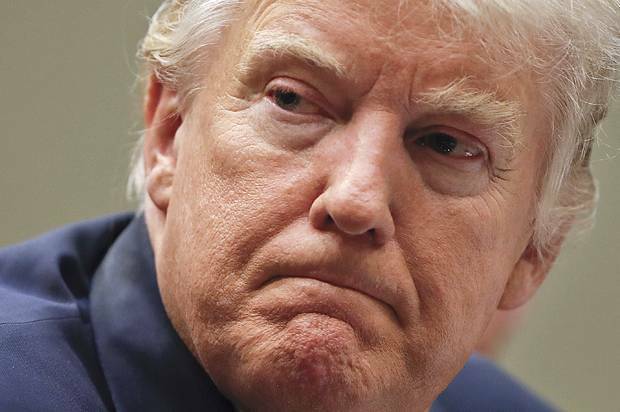 A point of attack upon Trump’s actions is the idea that nothing he does can have real meaning or encourage a favorable outcome for US foreign policy because his administration’s actions have not been based on a coherent national policy or strategy, an articulated policy on the Middle East, and consequently, an identifiable policy on Syria. Festinare nocet, nocet cunctatio saepe; tempore quaeque suo qui facit, ille sapit. (It is bad to hurry, and delay is often as bad; the wise person is the one who does everything in its proper time.) Despite reports otherwise, Trump has actually taken a logical, prudent approach to foreign and national security policy. He is determined to make decisions that are true to promises he made during the campaign. He has initially sought to develop a firm understanding of what realistically can be done rather than have his team rapidly produce policies from analyses based on the abstract as a matter of political expedience. The source for Trump’s unorthodox exercise of due diligence on policy may likely be his experience as a builder. In that field of endeavor, Trump often may have greatly admired architectural designs of structures proposed to him, but he would invariably wait for engineering reports, cost estimates, and analyses of his business team before deciding on anything. It is an evolutionary process. The result of that approach has been the construction of some very impressive properties worldwide. Current and former generals serving in the Trump administration, well-versed in military history, might find parallel with this apparent concept very likely guiding their president’s thinking and the words of US General George Patton, Jr.: “One does not plan and then try to make circumstances fit the plans. One tries to make plans firmly the circumstances.” Out of necessity, Trump has energetically taken action on urgent issues; the strike in Syria is a prime example of that. Further, Trump, along with other senior administration officials, have held bilateral and multilateral talks with other countries in international organizations. The practice of two prior presidential administrations was to make pronouncements on what could be done, poorly considering and matching possibilities with capabilities. They would then take action, the results of which were often failed foreign policy initiatives. An example of such an outcome was the notion promoted by the administration of US President George Bush in 2003 that US forces would enter Iraq and be greeted with cheers, open arms, and candy by Iraqis. Another example is the notion proffered by the administration of US President Barack Obama a decade later, that pronouncing “Assad must go” and supporting the Syrian Opposition Movement on the margins, would bring the Assad regime to negotiating table and its orderly release of the reigns of power would be arranged. Some might say their approaches were conventional. Nevertheless, they were wrong. When Trump stated “America First” during his inaugural address on January 20, 2017, he was presenting the term as a concept, a guiding principle indicating his administration would consider the interest of the US over anything else. Still, it would be fallacious to apply this concept to Trump’s actions if he has witnessed grave harm come to any long-time ally, partner or friend of the US, or innocent civilians of Syria, who he has suggested he would protect in safe zones if they returned home. Trump has a moral center, the values from which have a place in his foreign policy decision making. The Better Angels of Trump’s Nature? Undoubtedly, after learning of the Assad regime’s chemical attack, Trump undoubtedly asked his national security team to provide concrete answers on what to do in response. Trump did not simply vow to do something. He surely kept in mind Obama’s slow reaction in response to the Assad regime’s August 2013 crossing of a red line he drew on the use of chemical weapons. There was a chemical attack in a Damascus suburb and considerable evidence existed to support the accusation that Assad’s forces lainched it. Indeed, three days prior to the 2013 attack, the US had collected continuous streams of human, signals and geospatial intelligence, revealing regime military activities allegedly associated with preparations for a chemical weapons attack. Information gathered by the US from multiple streams clearly indicated that after those preparations were made, the regime executed a rocket and artillery attack against the Damascus suburbs in the early hours of August 21st. Satellite detections, specifically, corroborated that attacks from a regime-controlled area struck neighborhoods where the chemical attacks reportedly occurred–to include Kafr Batna, Jawbar, ‘Ayn Tarma, Darayya, and Mu’addamiyah. There was also the detection of rocket launches from regime controlled territory early in the morning, about ninety minutes before the first report of a chemical attack appeared in social media. The lack of flight activity or missile launches also led the US to conclude that the regime used rockets in the attack. US National Security Adviser Lt. Gen. H.R. 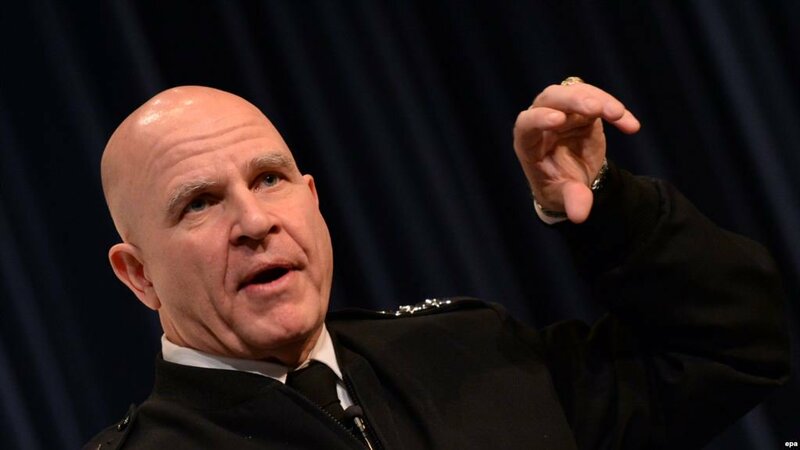 McMaster (above) has left open the possibility of further US military action in Syria. Perhaps members of Syrian Scientific Studies and Research Center who provide combat service support for units that launch chemical attacks could be targeted by US strikes. The Trump administration could also let Assad feel “personal discomfort” for his actions. For example, an attack could damage facilities providing electric power to the neighborhood in which Assad lives through the use of non-lethal technologies such as electromagnetic pulse weapons. Syrian chemical weapons personnel who prepared chemical ordinance for the August 21, 2013, and the April 4, 2017 chemical weapons attack included members of the Syrian Scientific Studies Research Center. The Syrian Scientific Studies and Research Center, which is subordinate to the Syrian Arab Republic Ministry of Defense, is tasked with managing Syria’s chemical weapons program. According to French Intelligence, the organization is responsible for producing toxic agents for use in war, pinpointing Branch 450 as responsible for filling munitions with chemicals and ensuring the security of sites where chemical agents are stockpiled. Syrian chemical weapons personnel were operating in the Damascus suburb of ‘Adra from August 18, 2013 until early in the morning on Wednesday, August 21, 2013 near an area that the regime was known to mix chemical weapons, including sarin. On August 21st, a Syrian regime element was surveilled preparing for a chemical weapons attack in the Damascus area. That element was using gas masks. US intelligence sources in the Damascus area did not detect any indications in the days prior to the attack that any Syrian Opposition forces were planning to use chemical weapons. A publicly released summary of the US intelligence community’s assessment of the April 4, 2017 chemical attack explains the Syrian regime maintains the capability and intent to use chemical weapons against the opposition prevent the loss of territory deemed critical to survival. It assessed that Damascus launched this chemical attack in response to a Syrian Opposition offensive in Northern Hamah Province that threatened key infrastructure. Senior regime military leaders were probably involved in planning the attack. According to the summary, a significant body of pro-opposition social media reports indicated that the chemical attack began in Khan Shaykhun at 6:55AM local time on April 4, 2017. The summary claimed further that the chemical agent was delivered by regime Su-22 fixed wing aircraft that took off from the regime controlled Shayrat Airfield. Reportedly, These aircraft were in the vicinity of Khan Shaykhun nearly 20 minutes before reports of the chemical attack began and were seen flying away from the area shortly after the attack. Additionally, the summary indicates personnel historically associated with Syria’s chemical weapons program were at Shayrat Airfield in late March making preparations for an upcoming attack in Northern Syria, and they were present at the airfield on the day of the attack. Much as the facilities, air assets, and personnel of Shayrat Airfield were targeted for cruise missile strikes, members of Syrian Scientific Studies and Research Center who provided combat service support for units that launched the chemical attacks should be targeted by US strikes. Strikes on them should be executed not only as a consequence to their participation in the operation, but with the goal of removing them from the equation in Syria and obviating the Assad regime’s ability to use chemical weapons in the future. The facilities and equipment of the Syrian Scientific Studies and Research Center, from bases and offices, to trucks and gas masks should be destroyed to severely curtail the organization’s ability to support any chemical attacks in the future. US should be confident enough after attacks to assess numbers of remaining personnel only of a size enough to maintain stores of the ordinance until the time that perhaps an international body entering Syria at a later date might become engaged in its management. Under no circumstances should the US allow attacks to create a circumstance where Islamic militant forces could gain control of the chemical weapons at any site. Further, according to US intelligence, Assad is the ultimate decision maker for Syria’s chemical weapons program. If a direct attack upon is not a viable option, the Trump administration could as a minimum let Assad feel some “discomfort” for his actions and let him know how vulnerable he truly is. For example, a precision attack could be launched on the Syrian infrastructure designed to severely damage electric power in the neighborhood in which Assad lives. It could mean the use of non-lethal technologies such as electromagnetic pulse weapons that can seize all electric equipment of any kind in the vicinity. While the well-being of Assad and his family members should not be placed in danger, the attack should impact their daily lives. Such calibrated attacks would bring the consequences of Assad’s chemical attacks literally to his home. Assad’s neighbors will also know that the strike against their electricity and their normally well-protected living space came as a result of Assad’s use of chemical weapons. It is human nature to follow. It is human destruction that results from following the wrong leader. Tillerson had previously met with Putin and senior Russian officials to secure oil deals while serving as the Chief Executive Officer of ExxonMobil. On June 21, 2013, Putin awarded Tillerson the Order of Friendship, one of the highest honors a foreigner can be bestowed by Russia after brokering a deal with the Russian state-owned energy giant Rosneft. However, Tillerson cannot, and will not, give any of that much importance now. 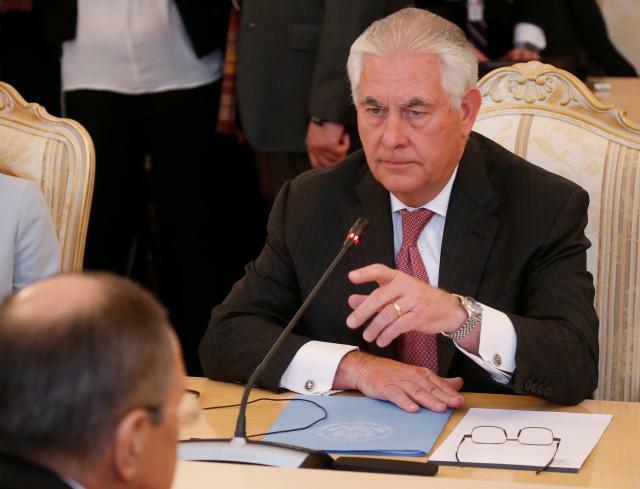 At the April 12, 2017 meeting, Moscow discovered that as US Secretary of State, Tillerson is still very professional and he will approach issues with a businesslike pragmatism. Can Tillerson Get a Handle on Russia? For hours after Tillerson’s arrival in Moscow, it was uncertain if Putin would even meet with him because of the tense state of relations. Putin’s spokesman, Dmitri Peskov, held out the possibility of a meeting once Tillerson arrived, saying any meeting would depend on the nature of Tillerson’s talks at the Foreign Ministry. Tillerson, unfazed by any of those developments, went forward with his meeting Lavrov, the metronome of Russian foreign policy and diplomacy. The meeting lasted for three hours. Tillerson eventually got the call to come meet with Putin, and left the Ritz-Carlton Hotel for Red Square around 5:00PM local time. That meeting lasted for two hours. 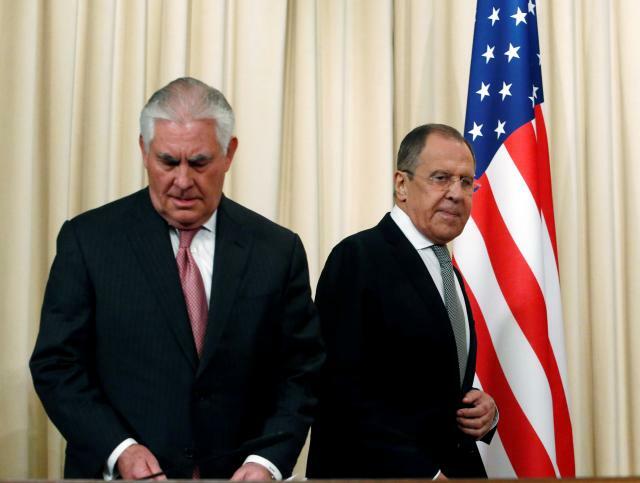 All that is publicly known about the content of Tillerson’s April 12, 2017 meetings with Lavrov and Putin, has been gleaned from remarks and responses heard at the post meeting press conference. On April 6, 2017, Tillerson expressed the view that Russia had “failed in its responsibility” to remove Syria’s chemical weapons under a 2013 agreement, which he argued showed Russia was either complicit with the gas attacks or “simply incompetent.” At the April 12th press conference, a journalist’s’ question on the matter enabled Tillerson to clarify that statement. He replied: “With respect to Russia’s complicity or knowledge of the chemical weapons attack, we have no firm information to indicate that there was any involvement by Russia, Russian forces, into this attack. What we do know–and we have very firm and high confidence in our conclusion–is that the attack was planned and carried out by the regime forces at the direction of Bashar al-Assad.” When Tillerson was asked about his conversations with President Putin on Syria, he replied: “Well, we did discuss at length the future role for Assad, whether it be in a future political process or not. Clearly, our view is that the reign of the Assad family is coming to an end, and they have again brought this on themselves with their conduct of the war these past few years. We discussed our view that Russia, as their closest ally in the conflict, perhaps has the best means of helping Assad recognize this reality. We do think it’s important that Assad’s departure is done in an orderly way so that certain interests and constituencies that he represents feel they have been represented at the negotiating table for a political solution. How that occurs, we leave that to the process going forward. We do not think one has to occur before the other can begin. And it will take a pace of its own. But the final outcome in our view does not provide for a role for the Assad–for Assad or for the Assad family in the future governance of Syria. We do not think the international community will accept that. We do not think the world will accept that.” Tillerson without question made it clear in his meetings that it would not be business as usual in US-Russian relations. His hope is to make things much better. A significant achievement of the talks was an agreement to establish a working group of US State Department and Russian Federation Ministry of Foreign Affairs officials charged with addressing smaller issues, which Lavrov called “irritants which have dogged our relations over the last couple of years,” and make progress toward stabilizing the relationship. That will allow Tillerson and Lavrov a freer hand to address urgent issues. They agreed to consider further proposals concerning the way forward in Syria; the respective allies and coalition partners of both countries would be consulted on the matter. There would be continued discussions directed at finding a solution to the Syrian conflict. Lavrov said Putin had agreed to reactivate an air-safety agreement, a de-confliction memorandum, concerning Russian Federation and US-led coalition air operations over Syria. Moscow suspended it after the US cruise missile strikes. Before its next contact with the Trump administration, Moscow will undoubtedly consider what cooperative role the US could play that would allow for the full exploitation of its capabilities in the anti-ISIS effort. Yet, if Moscow wants to cooperate with the Trump administration on Syria, it must create an environment that will facilitate such cooperation. For the moment, the transition of Assad regime to new politically inclusive government is the standing US policy. If the Trump administration ever decided to cooperate with Russia on Syria, it would signal its acceptance of Assad’s presidency as it is Russia’s policy to fully support it. However, to believe that might happen is to deny reality. Assad is at Russia’s disposition. A final decision on how to handle him will need to be made soon. Through the April 12, 2017 talks, an agreement to establish a working group of US State Department and Russian Federation Ministry of Foreign Affairs officials charged with addressing smaller issues of concern and help stabilize the relationship. They agreed to consider further proposals concerning the way forward in Syria and consult respective allies and coalition partners of both countries on the matter. Discussions directed at finding a solution to the Syrian conflict would be continued. Putin agreed to reactivate an air-safety agreement concerning Russian and US-led coalition air operations over Syria. Secrete amicos admone, lauda palam. (Admonish your friends in secret, praise [them] openly.) No international conference, no guarantees from Russia to keep him in check, no surgical procedure even, could make Assad palatable to the West at this point, or to any government in the Middle East other than Iran. Assad should not be seen as Russia’s proxy. By 2015, Assad appeared to lack the ability to remain in power against ISIS and perhaps US-backed Syrian Opposition forces. The military situation began recurvate after Russia, with the urging of Iran, moved its forces into Syria in September 2015 and supported Syrian military operations. Assad can only be useful to Russia as a figurehead, a symbol of resistance to the opposition and ISIS. In time, it may make sense to his benefactors to him with a leader who would be more acceptable among the Syrians. Reconstruction will be another huge hurdle for Russia to overcome. Lacking any significant resources from the US and the rest of the international community to rebuild, the only viable long-term goal in Moscow would likely be to convert Syria into a very large version of South Ossetia, Abkhazia, Transnistria, Donetsk People’s Republic, and the Luhansk People’s Republic. It would receive the recognition of very few countries, but not the US or major powers of Europe. Syria would in many ways would be shut off from the rest of the world. Even if it received a decent amount of economic aid from the Western countries and international organizations as the UN, the World Bank, or international Monetary Fund, Syria may never see an economic upturn. After observing the effects of few months of rain and wind on the ruins of cities and towns, Damascus might recognize that Moscow truly cannot support Syria in a way that would allow for its rebuilding. The situation would only worsen if pressure was placed on Russia over Syria through future sanctions. 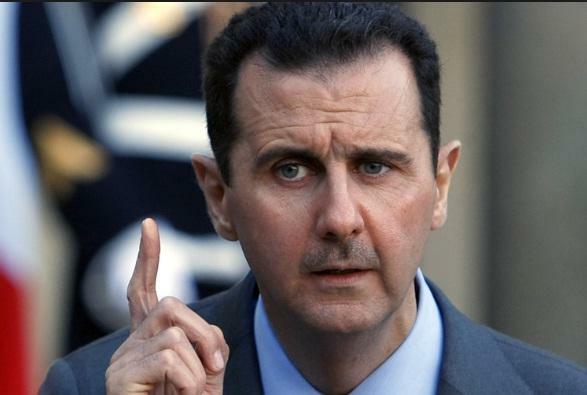 Assad (above) will not allow his reign to come to an ignominious end. He will make a stand before he goes. Concealed stockpiles of chemical weapons would allow him strike out even at his allies with some effect. He may believe as long as he has such weapons at hand, he is able to deter the few allies that he has from turning against him. Given the threat his chemical weapons actually pose to Russian Federation Armed Forces in Syria, Trump’s action may have started a discourse in Moscow on how to handle Assad weapons and prevent him from poisoning burgeoning relations with the US by using them. In Act I, Scene i of William Shakespeare’s tragedy, King Lear, elderly King Lear in ancient Britain is deciding to give up his power and divide his realm amongst his three daughters, Cordelia, Regan, and Goneril. He declares the daughter who can profess her love for him the most will receive the largest share. While he hoped Cordelia, his favorite would win, she refuses to play, offering a desultory response. Enraged, Lear disowns Cordelia accepting the soupy, excessive declarations of Reagan and Goneril who consequently set out to kill him. Before leaving the palace with the King of France, Cordelia having an intimation of the danger her sisters posed to Lear, states: “Time shall unfold what plaited cunning hides: Who cover faults, at last shame them derides. Well may you prosper!” The prognosis for the long-term survival of Assad’s presidency is not good. Today, many still believe Putin’s relationship with Assad is indissoluble. Quite often, Putin displays choreographed support for Assad. However, sometimes conditions can change to such a degree that one’s position must be altered. Patriotism permeates everything that Putin does. While not actually articulated, Putin has subtly promoted the concept of “Russia First”, a guiding principle similar in many ways to Trump’s “America First”. Putin will not subordinate the interests of the Russian people to those of another country, regardless of friendships, partnerships, or alliances. Putin would be remiss if he ignored big opportunities that would benefit Russia’s long-term interests. Assad would unlikely react well to even the prospect of a “shift” in his relationship with Russia. This entry was posted in 2016 US Presidential Election, Abkhazia, Antony Blinken, Donald Trump, Donetsk, Donetsk People's Republic, Free Syrian Army, FSA, General George Patton, General H.R. McMaster, God, Idlib, ISIS, Jr., Kremlin, Lavrov, Luhansk, Luhansk People's Republic, Mark Edmond Clark, Moscow, NSC, Obama, pundit, Putin, Raqqa, Russia, Russia vs. ISIS, Russian Federation Foreign Minister Sergei Lavrov, Russian Federation President Vladimir Putin, Russian Federation President Vladimir Vladimirovich Putin, Russian Foreign Minister, Russian Foreign Minister Sergei Lavrov, Russian President Vladimir Putin, Sergei Lavrov, South Ossetia, St. Augustine of Hippo, Syria, Syrian Arab Republic, Syrian Arab Republic Ministry of Defense, Syrian Arab Republic President Bashar al-Assad, Syrian Opposition Movement, Syrian Scientific Studies and Research Center, Tomahawk cruise missile, Transnistria, Trump, UN, United States, US Chairman of the Joint Chiefs of Staff General Joseph Dunford, US Marine Corps Commandant Joseph Dunford, US Marine Corps General Joseph Dunford, US National Security Adviser H. R. McMaster, US National Security Council, US President Barack Obama, US President Donald Trump, US Secretary of Defense James Mattis, US Secretary of Homeland Security John Kelly, US Secretary of State, US Secretary of State Rex Tillerson, Vladimir Vladimirovich Putin, William Shakespeare by greatcharlie. Bookmark the permalink.